Hunza Properties Bhd (HPB) is looking at generating RM3 million in annual rentals from its office block within its Gurney Paragon integrated development on Pulau Tikus. Executive chairman Datuk Khor Teng Tong said yesterday the 10-storey office block, which boasts a total floor space of 10,000 sq ft, has already seen a take-up rate of 70 per cent. "Two floors will serve as HPB's corporate headquarters and the other tenants so far include professional firms," he said at a briefing on HPB's half-year results for its year ended December 31 2012. 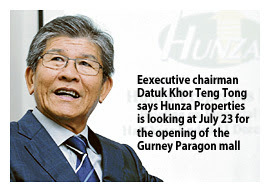 Khor said each floor measures around 10,000 sq feet, with rentals ranging from RM320 to RM350 per sq ft.
"We are looking at a tentative date of July 23 for the opening of the Gurney Paragon mall," he added. HPB is targeting international and national fashion brands along with food and beverage outlets as potential tenants once the mall is launched. Gurney Paragon sits on a 4.13ha site with dual entrances of the sea-fronting Gurney Drive and Jalan Kelawai. Apart from the office block, which will sit atop the shopping mall, the integrated project comprises two high-end residential condominium blocks with a development value of RM495 million and a restored heritage building - which used to be St Joseph's Novitiate - as its centrepiece. St Joseph's Novitiate, which has been renamed St Jo's, is home to several retailers and food and beverage outlets. Meanwhile, Khor said HPB posted RM57.7 million in revenue and RM11.7 million in net profit after tax and minority interest in the second quarter. It posted RM54.1 million in revenue and RM14.4 million in net profit for the preceeding year's period.